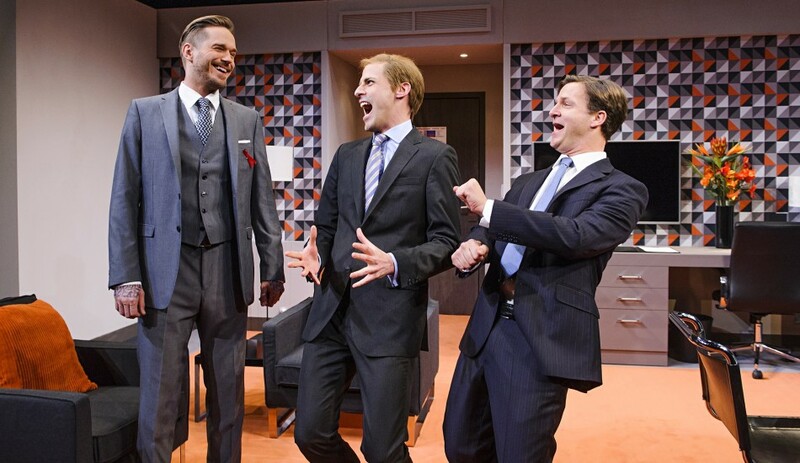 The Three Lions has just opened in Victoria’s swanky St. James Theatre, having premièred at the 2013 Edinburgh Fringe festival. 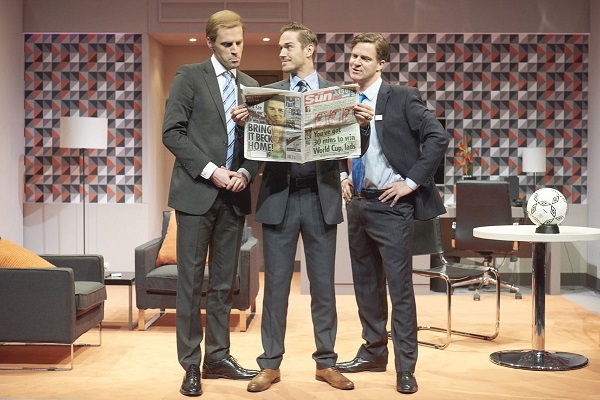 The play imagines what happened when Prince William and Davids Cameron and Beckham met in a hotel to bid for the right for England to host the World Cup, in a sort of Fawlty-Towers-meets-football comic drama. It is as ridiculous as it sounds but, unfortunately, not as funny. The tone of the play was set at the early entrance of Séan Browne (playing David Beckham), which also produced the play’s first big laugh, down to the physical similarity of the actor to the character and the high-pitched Essex voice. This clearly marked the play out as caricature play, not biting satire. David Beckham’s IQ fluctuates throughout the play. At some points, he is leading the conversation with the Prime Minister and the second in line to the throne; at other points he is mistaking Vladimir Putin for Sarah Palin and is confused by the apothegm “two left feet”, a phrase so bound-up in the tradition of nonsensical and aphoristic football discourse, it could just have easily have been a racist/sexist/homophobic/generally bigoted comment, such is its free use in discussions of the “beautiful game” (there goes another). The problem with David Beckham, and even more so with our society’s patronising caricature of him, is that he is an innately humourless person. The simple, dull sentences delivered in a flat, infantile fashion are just not entertaining. Similar problems extend to the play’s other main characters. Prince William is someone we feel we all know; barely a week passes without footage of him grimacingly shaking hands with snotty-nosed four-year-olds from some godforsaken town, like Swindon. But when he is portrayed on stage, it quickly becomes apparent that, aside from facts gleaned from Wikipedia and speculation from Heat magazine, we really know very little about him as a person. In The Three Lions, we see him as the achingly uncool old-Etonian, trying to ingratiate himself with Beckham and restrain his inner mischief (he plays several pranks on the Prime Minister). Plausibility is not exactly this play’s strongest point. Yet, perhaps that is misguided and unwarranted snobbery, especially given the premise of the play. We were never really going to get a true account of their meeting and therefore the play was always going to veer into spoof. In which case, we have to judge the play on its comedic and fantastical merits. Except that here, we also find it lacking. And it comes down to one simple fact: there is no plot. We hear almost nothing of England’s bid to host or, most salaciously, no real details of the corruption so infamously rife in FIFA. What’s more, the dialogue is clunky – humour relies on thematic tropes like Freudian slips rather than its own wit. With no story and only vague outlines of people we recognise acting wholly predictably in this absurd situation, there is little to laugh at except a few witty lines that hang off our existing knowledge of these three and, for those who are so inclined, a few moments of high farce.